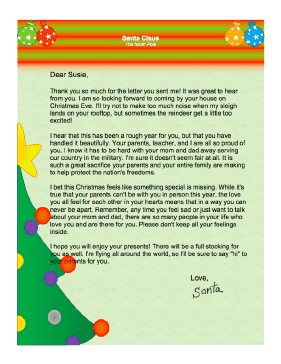 This printable letter from Santa Claus brings warm holiday wishes to a child whose parents are away from home in the military. Thank you so much for the letter you sent me! It was great to hear from you. I am so looking forward to coming by your house on Christmas Eve. I'll try not to make too much noise when my sleigh lands on your rooftop, but sometimes the reindeer get a little too excited! I hear that this has been a rough year for you, but that you have handled it beautifully. Your parents, teacher, and I are all so proud of you. I know it has to be hard with your mom and dad away serving our country in the military. I'm sure it doesn't seem fair at all. It is such a great sacrifice your parents and your entire family are making to help protect the nation's freedoms. I bet this Christmas feels like something special is missing. While it's true that your parents can't be with you in person this year, the love you all feel for each other in your hearts means that in a way you can never be apart. Remember, any time you feel sad or just want to talk about your mom and dad, there are so many people in your life who love you and are there for you. Please don't keep all your feelings inside. I hope you will enjoy your presents! There will be a full stocking for you as well. I'm flying all around the world, so I'll be sure to say "hi" to your parents for you.